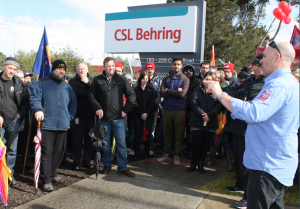 AMWU members at CSL Behring, who make vital blood plasma products and maintain factory equipment, staged a 4-hour work stoppage last Friday in response to the pharmaceutical giant’s refusal to accept a fair workplace deal despite its stunning $1.89 billion profit in the past year. The union’s 100 members in laboratory and maintenance, which have already imposed administrative and overtime bans along with partner unions the CPSU and the ETU, said they will continue their protected industrial action on Monday after CSL management told delegates it would keep pushing its proposal to employees until it is “voted up”. Last week, the workforce at Broadmeadows rejected CSL’s proposal, which gives a pay rise but effectively lowers performance pay and freezes key allowances while also removing any job security for any new employee hired on a contract. AMWU Assistant State Secretary Craig Kelly said members only demanded a modest overall increase in take-home pay to reflect their value in producing life-saving blood products used in hospitals and clinics every day. “Our members helped this company to its record profit, but all CSL give back is a sub-standard offer which leaves us with no other choice but to intensify bans and stoppages,” he said. AMWU delegate Shannon Brooks said CSL’s proposal included allowance freeze that would hit members who counted on these to supplement their wage. According to him, CSL’s proposal only upped performance incentive for production managers while leaving the rest of the workforce behind in a “cynical attempt” to break down the “no” vote. “Management considered our proposals for 22 minutes and came back saying no, no, no – so there’s no choice for us but to keep showing them we’re serious about defending our wages and conditions,” Mr Brooks said.